The upcoming financial crisis will be the third financial crisis in a row, and yet, the masses have not realized what is going to come in a few years. It’s not a conspiracy, but it is apparent to me that the fear of the end of the United States, the coming of a global financial catastrophe in which masses of people – even from the developing nations like India and China – would lose their jobs, wherein people would literally go on for days without food, and worldwide riots would become a daily phenomenon, is seeming highly likely. It is an alarm that in spite of all the developmental theories and state-of-art economic systems of the West, the world has inevitably turned into an exploiting ground for the elite and super powers, who cross the red lines so often as to make humanity vulnerable to any small miscalculation on their part; where the failure of one hedge fund in a large investment bank (i.e. similar to that of Bear Stearns before the 2008 global financial crisis) could start a global crisis, that smells much like an Armageddon. The instability of this financial system is shocking. Knowing even that more than 30 million people became unemployed and millions lost their homes in the last financial crisis, at a point in time; it started to sound like a conspiracy theory to me. How could I even rationalize that a few people like the former treasury secretary Hank Paulson, also known as “The Snake” by the Wall Street executives, can single handedly promote an infrastructure that literally destroyed millions of lives? Does God not watch over the things we can’t control? Well, God does love his creations, i.e., even those on the other side of the globe were affected; in China, 10 million got jobless, but they still – in spite of the hard time – found food and shelter. In history, it is always a few people who make mistakes and in consequence, the masses pay. The difference in this era is that technology, science and the infrastructure have made it possible to make it bigger, globalizing the once local scams to states and nations. So even the pot smoking CEO of Bear Stearns, Jimmy Cayne, gambled so big today in the pre-Mortgage crisis era that when his bets started to turn against him and his company fell, it started a global financial crisis. The paranoia chills and the scares got over when I rationalized that the destiny of the masses was nothing but much suffering. But no matter how big of a blow the few powerful give them, they still do survive, although the greedier lot gets the worst of the misery. The greedy Americans, who bought the moral hazard, bought homes on mortgages even when their pockets did not allow them, or in other words, got their spending habit way out of control, were affected the most. In weeks and months, they made fortunes; but in a few years, when the bubble burst, they had lost everything and came on the streets. It takes my breath away still looking at those millions of people who worked their entire life in capitalist industries and services, when one day they just got laid off without any reason and got on the streets because of the mistakes a handful of lobbyists, made halfway around the world. If there can be tent cities in Europe and America, if all the American masterminds cannot stop California from going to ruins, if nations like Greece cannot pay their creditors, if nations like Iceland can be categorized as terrorist on lists with Taliban, then when the real bubble of all bubbles explodes, I cannot imagine what will happen in the developing nations! In the late 1990s, there was heavy investment and huge venture capital funding for startups of the dot-coms, because big investment firms came into being, the GLB act and deregulation helped make this nightmare come true. The bubble bursted when these dot-coms could not turn out profits as they never had the potential to, no private entity would finance these crazy investments, and these few investment banks had made the markets much of a Casino where they gambled with the people’s money. The only ones to have mindboggling rise in profits were the few masterminds who created the infrastructure or the ones who thoroughly knew this system. The dot-coms failed, and followed a market crash in 2001, which led to a 5 trillion dollar loss. Then the terrorists attacked the twin financial centers, located in the middle of the great New York City; I would not talk on the basis of presumption, but the biggest advantage of 9-11 was the kickstart of the financial weapons of mass destruction; the CDOs, the Subprime Mortgages and the Derivatives. Although it was hard to imagine investment frauds after the dot-com bubble and the 9-11 attacks, but like always, the US government did not focus on paying the price for their mistakes, they rather pretended that everything is fine and kept everyone happy by letting the party go on. To kickstart these weapons, the US government encouraged the people to spend and lowered the interest rates to 1%. The few gigantic investment banks had a fantasy come true, and with the final piece of the puzzle in place, they started once again investing heavily in anything they could misrepresent and resell with a premium in the open market. It seemed at a time that the new ways of the financial institutions were a success and there was a global party going on. Forget the oil reserves of Iraq and the heroine of Afghanistan, individuals like Jimmy Cayne sitting in their offices made billions in a few years, and it was not just Jimmy Cayne, rather it was all those capitalists who got a chance. It was not just America – London and New York were in a competition to be the financial capital of the world, so London’s Prime Minister Gordon Brown issued the Light-touch regulation, also deregulating the city to attract financial institutions. People in the investment and derivative business went from rags to riches, re-selling and misrepresenting stocks. They made a global bubble! Iceland was truly a land blessed by God, with an abundance of natural resources, clean energy and a thriving economy. One man, Prime Minister David Oddsson, with his free market ideas, tried to privatize every government institution; even so he succeeded in privatizing Iceland’s main resources, its fishing grounds and its oldest banks. Soon, there was a huge rise in property value; the government encouraged the people to buy even two homes. With lowered interest rates and huge investments coming in from banks, there was a bubble. All bubbles burst at some time, so did Iceland’s; at the crash, Britain froze all the assets of Iceland in foreign accounts, and put Iceland in its anti-terrorism legislation along with names such Al-Qaeda and Taliban, leaving them with zero credibility. The catastrophe was in each Icelander’s home and, at last, masses of Icelanders gathered with pots and pans, forcing their President to resign. The US also had the real estate bubble, but they did not just keep it to themselves; rather, they sold these faulty mortgages in packages called the CDOs and Subprime Mortgages to all over the world. When BNP PARIBAS (French bank) blew the whistle, followed by Lehman Brothers declaring bankruptcy, their bubble exploded; it ended up all over the world, making it a global financial crisis. The credit system failed, all the major banks of the world stopped lending each other and all financial channels got blocked! The unimaginable catastrophe became a reality; one fine morning when the Europeans and Americans woke up they found finances and trades blocked. They couldn’t do anything other than anticipate the gravity of their losses; there was no one to save them, their homes, their life savings. The governments also proved it, giving trillions of dollars worth of bailouts, not to the people affected by the economy but only to the corporate. Only a third of those bailouts were short term, timely and to the point (accurate), the rest just went to waste by not contributing positively but rather contributing to overspending, and again making small bubbles all over the globe. The Europeans pointed out all fingers at the US for letting Lehman Brothers fail, but still, they did not address the real issue, the reason being that they were also following the same practices with their banks and also having the same leverage ratios as those of the US. Hank Paulson, the United States Secretary of the Treasury, who increased the interest rates which led to the crisis, had seen repetitive signs and facts that the US had too much credit and that Subprime Mortgages had spread like a virus in America and beyond. Still, he did not take it as an issue till the very end. Just before Lehman Brothers’ bankruptcy, Hank Paulson had an emergency meeting with the CEOs of major investment banks, but Britain backed out, not taking Paulson’s last minute concerns seriously. Since then, Hank Paulson knew that he could not stop the tsunami and, worst of all, he had no answers. China’s main exports were to America, and with America canceling out all new orders, not even being able to pay for the shipments China had exported in late 2008, China’s industry was bound to undergo a major recession. Chinese companies cannot file bankruptcy to protect themselves against creditors; so many Chinese industrialists disappeared over night in fear of the worst. Factories were closed and workers who were already owed months of wages got laid out. An estimated 15 million of poor Chinese workers got fired as a response to the global crisis, and many of them did not have food to eat for days at a stretch. French workers who considered employment a human right started kidnapping their CEOs on factory closures and layoffs, the French Prime Minister, disturbed by this fact, gave a speech denouncing the way of the markets and promised major reforms in the capitalistic economic structure. He said that he would base his reforms on measured economic facts, reasoning, “What gets measured gets done!” and of course, how can an economy improve if its financial products cannot be measured. Heavy borrowing is the capitalists’ preferred policy to deal with their system’s latest crisis. Since 2007, capitalist governments everywhere borrowed massively, running into large budget deficits, and their national debts soared. Borrowing has only helped reduce the criticism, resentment, anger, and anti-system tendencies among those fired from jobs, evicted from homes and deprived of job security and benefits; nothing more. The irony of the situation is that it does not just stop at deception, but the masses are bound to suffer more even as the economy is getting out of recession; the European Commission expects spending cuts worth 0.25% of Eurozone GDP to be implemented in 2014. Italy and Spain are being forced to borrow, or in other words, are being forced to seek help from the European Central Bank’s (ECB) emergency bailout scheme, known as “outright monetary transactions”; and as irrational as it sounds, in the coming years, they are being told to redraft their tax and spending plans or risk breaching Eurozone debt rules in 2014. Therefore, Spain has announced in November 2013 that it would leave the €41bn (£34bn) EU bailout program it has drawn on to rescue its teetering banks. In the recent research into the human cost of the crisis, it was found that between 2007 and 2012, reported average life satisfaction declined by more than 20% in Greece, 12% in Spain and 10% in Italy. “In the wake of the crisis, household income and wealth, jobs and housing conditions deteriorated and have not completely recovered yet in many OECD countries,” says the How’s Life report. The think tank’s research into Greece suggests the the average Greek household has been “severely affected” by the crisis, particularly when it comes to household income, jobs, life satisfaction and civic engagement. From 2007 to 2011, Greece recorded a cumulative decline in real household disposable incomeof around 23%, the largest decline among the OECD countriesyrecordurr di.bies,&rdiqucame sury, who id&r2arowtervenowould lmong reportednco1.2% measured. From 2007 , not rIn trtednco t to th laraits tehey atill bs, liiedy to deal wilit thftervf/p> 59%From34around 2heres nhrs, soundsmong r, wts soared. The Body Economic: Why Austerity Kills”, a health crisis is being triggered by austerity policies, including up to 10,000 additional suicides which have occurred across Europe and the US since the introduction of austerity programs. Moreover, Barry Eichengreen and Kevin H. O’Rourke write that the IMF’s new estimate of the extent to which austerity restricts yr, and indicates buying opportunities in times of fear (readings of 40 and above), and times to be cautious when investors are too complacent (readings under 15). 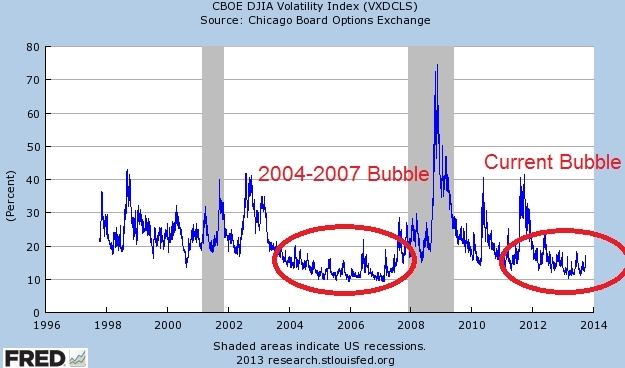 The VIX is indicating that investors are too complacent, which is exactly what happened during the last bubble cycle from 2004 to 2007. 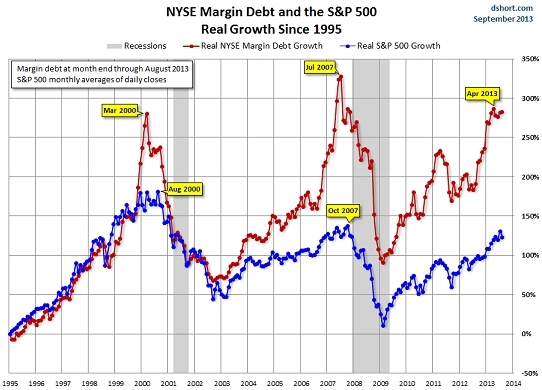 Another sentiment indicator, NYSE margin debt, has soared to levels that marked the peaks of the prior bubbles in 2000 and 2007. This shows that traders are so confident in the market’s prospects (a contrarian signal) that they are leveraging their bets with borrowed money, which is further boosting the market by increasing traders’ buying power. After all this knowledge, you would have come to the conclusion that we are at the end of something big, even if it’s not the Armageddon. Today, there are small bubbles all over the world, i.e., countries like China are also having bubbles, as like Dubai, they are having massive residential constructions from which a lot is not required. When the Chinese realize this, there is going to be a big crisis there as well. On the whole, the stimulus packages and bailouts are helping the corporations overspend, which is creating an artificial demand in different markets all over the world. When people start questioning the authenticity of these artificial demands, there is going to be a complete meltdown of the global economy. We need to review our financial system completely, or rather, a rethinking of capitalism is needed; financial products of mass destruction cannot be allowed. Sometime soon, the alcoholic economy would not go on with giving it more alcohol; let that time not come when the alcoholic dies, when even Gold would not be able to save us! The paranoia chills and the scares got over when I rationalized that the destiny of the masses was nothing but much suffering.